Scotland full-back Stuart Hogg has been given a three-week ban following his red card in the 51-3 defeat to Six Nations rivals Wales on Saturday. It means the Glasgow Warriors player, 21, will miss the Pro12 games against Scarlets, Ospreys and Edinburgh. Hogg was shown a red card for a late challenge on fly-half Dan Biggar in the 22nd minute of Saturday's match. The disciplinary committee said his punishment would have been longer had he not shown so much remorse. It explained an offence of playing an opponent without the ball should have resulted in an "entry-point of a five-week playing suspension". But it added it had granted Hogg a "40% reduction" in his punishment to "account for mitigating factors, including the player's remorse for the incident both on the day of the match and subsequently through the media". Hogg apologised to both Biggar and referee Jerome Garces following the incident and issued another statement through Scottish Rugby Union following the disciplinary committee's decision. "I'm very sorry," he said. "I have let people down and apologise to my team-mates, the Scotland management and all Scotland supporters. "I am disappointed to be missing three games but fully respect the committee's decision." Garces initially sin-binned Hogg for the tackle but changed his decision to a red card after viewing the incident on the big screens at the Millennium Stadium. It meant Scotland played almost an hour with 14 men and suffered their biggest Six Nations defeat as the home side ran in seven tries. 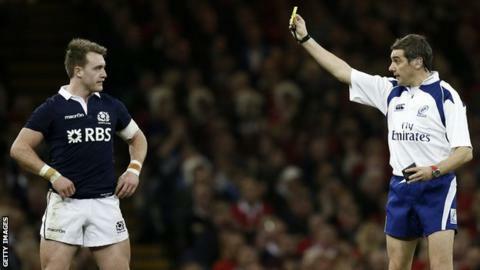 Hogg is only the third Scotland player to be sent off in a Test match, following Nathan Hines in 2002 and Scott Murray in 2006. Outgoing Scotland head coach Scott Johnson defended Hogg following his red card, insisting the full-back was not a dirty player. Scotland's defeat in Wales meant Johnson's side finished second bottom of the Six Nations table with only one victory, against Italy in Rome.